Objective of HRM Objectives are pre-determined goals to which individual or group activity in an organization is directed. Objectives of personnel management are influenced by organizational objectives and individual and social goals. Institutions are instituted to attain certain specific objectives. The objectives of the economic institutions are mostly to earn profits, and of the educational institutions are mostly to impart education and / or conduct research so on and so forth. However, the fundamental objective of any organization is survival. Organizations are not just satisfied with this goal. Further the goal of most of the organizations is growth and / or profits. Institutions procure and manage various resources including human to attain the specified objectives. Thus, human resources are managed to divert and utilize their resources towards and for the accomplishment of organizational objectives. 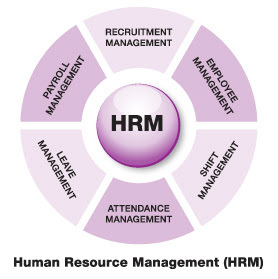 Therefore, basically the objectives of HRM are drawn from and to contribute to the accomplishment of the organizational objectives. The other objectives of HRM are to meet the needs, aspirations, values and dignity of individual employees and having due concern for the socio-economic problems of the community and the country. To create and utilize an able and motivated workforce, to accomplish the basic organizational goals. To establish and maintain sound organizational structure and desirable working relationships among all the members of the organization. To secure the integration of individual or groups within the organization by co-ordination of the individual and group goals with those of the organization. To create facilities and opportunities for individual or group development so as to match it with the growth of the organization. To attain an effective utilization of human resources in the achievement of organizational goals. To identify and satisfy individual and group needs by providing adequate and equitable wages, incentives, employee benefits and social security and measures for challenging work, prestige, recognition, security, status. To maintain high employees morale and sound human relations by sustaining and improving the various conditions and facilities. To strengthen and appreciate the human assets continuously by providing training and development programs. To consider and contribute to the minimization of socio-economic evils such as unemployment, under-employment, inequalities in the distribution of income and wealth and to improve the welfare of the society by providing employment opportunities to women and disadvantaged sections of the society. To provide an opportunity for expression and voice management. To provide fair, acceptable and efficient leadership. To provide facilities and conditions of work and creation of favorable atmosphere for maintaining stability of employment.